'Citizen Kane' Blu-ray Date and Supplements Revealed! Orson Welles' timeless classic is coming to Blu-ray in September! 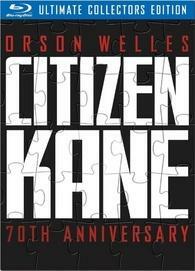 As previously reported, Warner Brothers is preparing 'Citizen Kane: 70th Anniversary Ultimate Collector's Edition' for Blu-ray later this year, and now the official release date looks to be September 13. Depicting the controversial life of an influential publishing tycoon, this Best Original Screenplay Academy Award® winner (1941) is rooted in themes of power, corruption, vanity -- the American Dream lost in the mystery of a dying man's last word: "Rosebud." Specs have yet to be revealed, but the film will be receiving a 4k restoration and supplements include: Audio commentaries with Peter Bogdanovich and Roger Ebert; World Premier of Citizen Kane featurettes; one move down two Interviews with Ruth Warrick and Robert Wise; Production galleries (featuring commentary from Roger Ebert); Deleted scenes; Theatrical trailer; Full-length The Battle Over Citizen Kane documentary on DVD; and HBO Films' docudrama RKO 281, starring Liev Schreiber as Orson Welles and James Cromwell as newspaper magnate William Randolph Hearst on DVD. This set will also include a 48-page collector's book, 20-page reproduction of the 1941 program, lobby cards, and production memo and correspondence reproductions. Amazon also has an exclusive version that also includes 'The Magnificent Ambersons' on DVD. Suggested list price for the Blu-ray set is $64.99 while the Amazon exclusive is $79.89. You can find the latest specs for 'Citizen Kane: 70th Anniversary Ultimate Collector's Edition' linked from our Blu-ray Release Schedule, where it is indexed under September 13.